SMW 2013 Results page added showing how well the pot hunting club members did at Telford. Our visit to the BAe System Archive at Farnborough took place on Thursday 5th December, thanks to Howard Mason, the Heritage Manager. At 6.30 pm a gaggle of cars were almost blocking the entrance to the Ively Gate, mush to the displeasure of the woman at Security. Eventually Howard led a convoy of cars around the perimeter to The Black Hanger where we were shown around the large collection of fascinationg stuff! HIghlights were the Air Speed Record certificate found in a box under the DeHavilland company Tug of War trophy; Geoffery DeHaviland's flying Helmet; the silver Kings Cup from 1934; the 3 million item photo archive; with pictures goign all the way back to the early 1900 on glass plates; the Certificate of Air Worthiness for the original Comet jet airliner and the art archive with many superb paintings all stored in a climate controlled room. One finally interesting tidbit, a collection of Gloster Javelin photos found in a box, but the piece of paper wrapped around them was a design for a Spitfire-like aircraft with a Barbette turret in the fuselage behind the pilot! 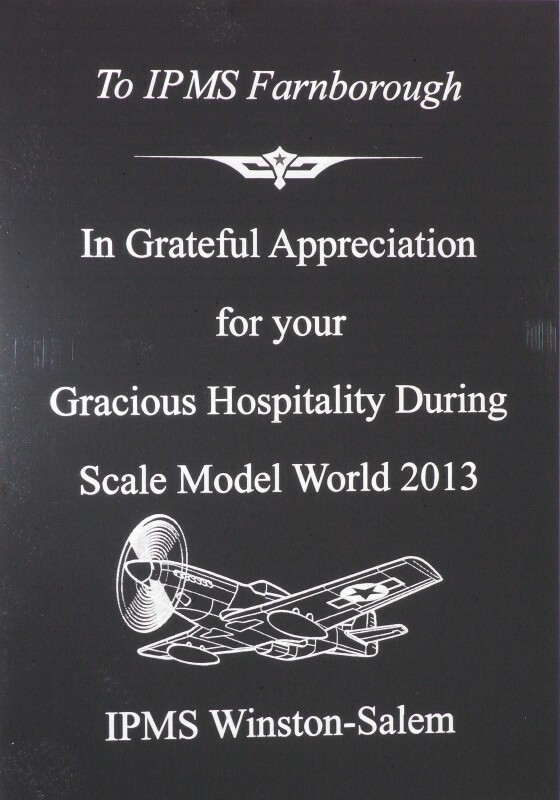 All in all it was a fascinating trip, with Howard topping it off by saying that if anyone wants to undertake research or to volunteer to help catalog stuff, or to help maintain some of the plethora of old models, he'll be happy to hear from us! It was great to see our old friends again, come and visit again soon guys! Good luck to him and to everyone else entering the competition! 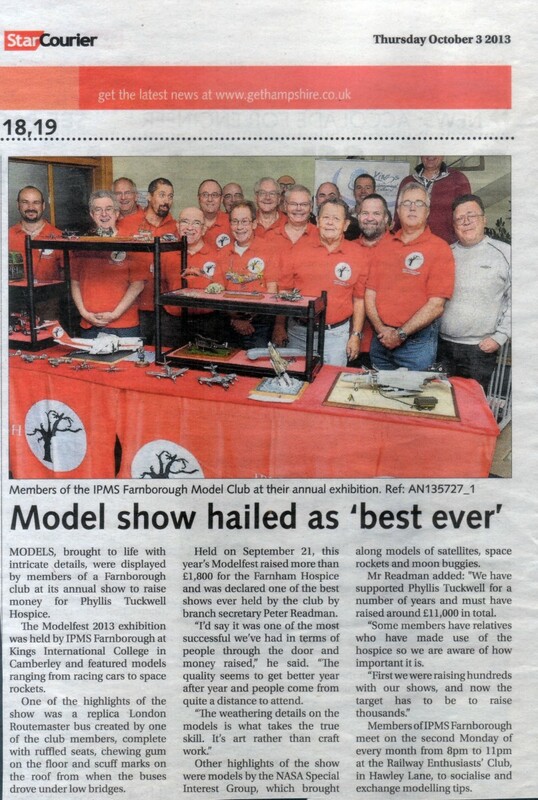 Modelfest makes the local newspaper! Nic, really!!! Competition gallery and results table are now up to date with the September competition. Added letter from the Phyllis Tuckwell Hospice, that charity we support via Modelfest. Where is everybody? Did anyone mention the fire alarm?